Chimney fires and why tar can cause chimney fires! In Cornwall, the council stated in a recent report that nearly 6,000 chimney fires occur every year in England. Most of these fires were a direct result from not maintaining the cleanliness of chimney, specifically the removal of tar. In most instances, the chimney fire resulted in substantial structural damage to the property. In a few cases the residence was damaged beyond repair. Understanding the dangers of tar accumulation and how to prevent tar accumulation on your chimney could save your home. How does tar build up in the chimney? Unlike cigarettes, which have a definitive presence of tar, many of the chemicals which form tar buildup in a chimney are not identifiable on a label. Wood and other natural materials which can produce tar are often overlooked. However, even these natural burning materials release tar elements. Greenwood (which is wood that has not seasoned for over 6 to 8 months) has a higher probability of emitting tar than dry wood. When burning wood, the sap and other burning elements combine and accumulate, slowly, on the walls of the chimney. Synthetic burning logs, which contain a great deal more chemicals than natural wood, can produce creosote. Creosote is very flammable and is the cause for many chimney fires. Of course, if you burn other materials which you should not in your fireplace (such as newspapers, magazines, or papers containing ink) you are contributing to the chemicals found in the tar. If you light your fire and notice that smoke is accumulating in the house, this may be caused by a tar build up. The more tar which is built up, the more smoke will seep into the house. As your flue is the only egress for the smoke, a buildup which minimizes the flow of smoke will cause the smoke to back up into the house. If you have a fireplace with glass doors, look to see if the doors have a sticky layer of tar on the glass. This is a good test to see the condition of the rest of the chimney. Tar which is accumulating on the glass of your fireplace is also accumulating along the flume of the chimney. If you find that the glass of the fireplace has tar buildup, then you should have your chimney cleaned. If you light a fire and notice that tar is dripping down from the flue and into the fireplace, you should cease use of the fireplace IMMEDIATELY as you have a very severe case of tar buildup. 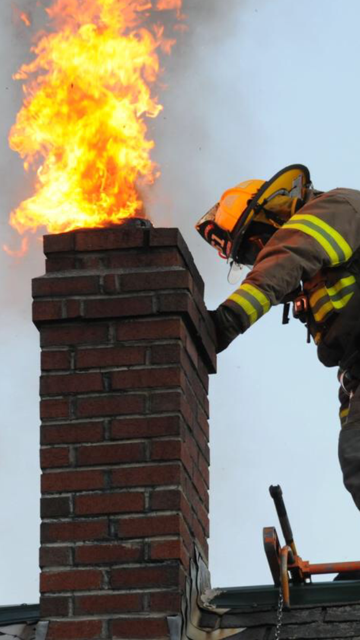 In such cases, the potential for a chimney fire is extremely high. If tar is dripping into the fire this means that your chimney has become so clogged that the heat cannot escape the chimney. The heat is therefore trapped and is melting the tar which has built up. As the tar is heated it is dripping into the fire. The danger here is that the heat will ignite the tar as the tar will continue to heat up. Where it is true that you can maintain a level of safety and maintenance from self-cleaning your chimney, you cannot remove the tar completely unless you have specific tools to do so. Tar which has seeped into the mortar needs to have deep cleaning applied to the chimney to remove the tar. Also, the entire flue (not just close to the base where the fire is started) needs to be cleaned. Our professionals at SM Sweeps will work closely with you to ensure that your chimney is cleared of any potential flammable materials, that such cleaning is done quickly and professionally, and that (should you chose) maintenance is conducted regularly on your chimney to maximize the life of your chimney and reduce potential disasters which can occur from a lack of maintenance. If you have a chimney which has tar buildup, or if you are concerned about the cleanliness of your chimney and would like to have a professional clean/maintain your chimney please contact us. We will be more than happy to address any inquires you may have about the fire dangers presented from tar accumulation, tar removal, or any of our services. We are here to help you.